*Michael Jackson’s estate has filed papers opposing a bid by the late singer’s father to receive a monthly allowance, arguing it would take money away from the singer’s three kids. Joe Jackson filed for a $15,000 monthly stipend in November, saying he had little income and relied on his son’s help to survive, reports the Associated Press. But the filing stated that Jackson failed to show that his son supported him while he was alive. The filings also note that the singer omitted his father as a beneficiary in his will and trust, and that any money paid to Joe Jackson would reduce the estate’s assets available for Michael Jackson’s mother and children. It will be up to a judge to decide whether Joe Jackson receives any money from the estate. He is seeking payment for expenses that include $1,200 a month on rent for his Las Vegas home; $2,500 to eat out; $1,000 on entertainment, gifts and vacations; $2,000 on air travel and $3,000 on hotels. A hearing on the petition is scheduled for Jan. 28. 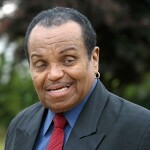 Joe Jackson’s time for being paid have been over since the group broke up yet he’s continued to live large. At 80 something to ask for 15 thou is not only greedy its unheard of. He’s been doing fine all these years living the life of a superstar and why the estate needs to pay him now is curious. As long as Katherine is receiving an exorbitant amount he will always have dough so why rock the boat?! This is so damn ridiculous! !